The Device Manager lists and controls the devices used as a source of packets in the application. If the view is not visible, show it by selecting the Views > Device Manager menu item. The devices list will be empty the first time you open the manager. You need to populate this list by manually adding each device as needed (see the "Adding Devices" section for instructions). Once the list has been populated, each device will be displayed in an individual control containing the following information: vendor icon, alias, status, extended status, and a switch to change the device status (see the figure below). The status will display "Offline" if the device is not plugged to your computer, "Idle" if it is plugged but not started, and "Capturing…" when it is plugged and started. The extended status will display additional information related to the role of the device in the application. For instance, the extended status of a sniffer device capturing packets will show the channel and protocol stack used for decoding. The Found New Hardware wizard might appear. In such case, follow the instructions on the screen to install the device drivers. If you need to manually specify the location of drivers, you will find them in the Program Files\Ubilogix\Drivers folder. Wait a couple of seconds while the driver is installed and the device recognized. Available Devices section, select your device. After the selection is made, Ubiqua will fill in the Application section with specific vendors. Select the device you want to add. If no devices are found try searching again by clicking the Refresh button at the top right corner of the Add Device window. From the Application combo box select the appropriate device application. It is also possible to add devices by specifying custom values for properties such as baud rate, data bits, stop bits and others. 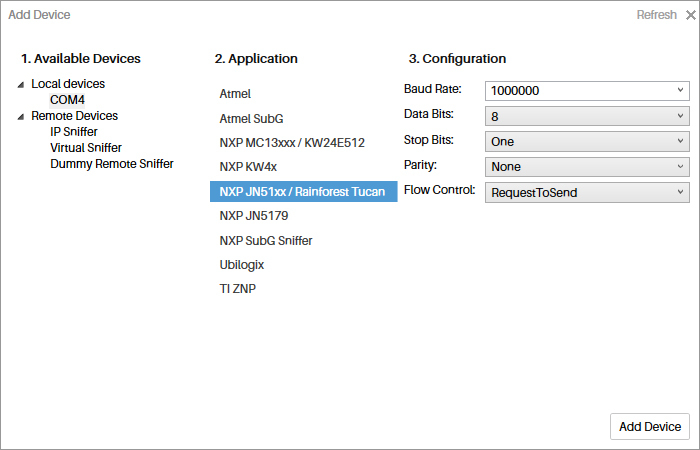 When setting up Sewio Open sniffer for the first time, we must configure the sniffer via its web interface, aditional information can be found in http://www.ubilogix.com/ubiqua/documentation/guide/sewio-hardware/. Once you have installed the drivers and added the device to the list, you can configure its properties by right-clicking on the device and selecting the View Properties menu item (see the figure below). This will open the Properties view, where the properties can be edited. As long as the Properties view is open, it will show the properties of the selected device in the Device Manager. Please keep in mind that if the protocol or channel is changed, and the device is running, you must stop and start it again. 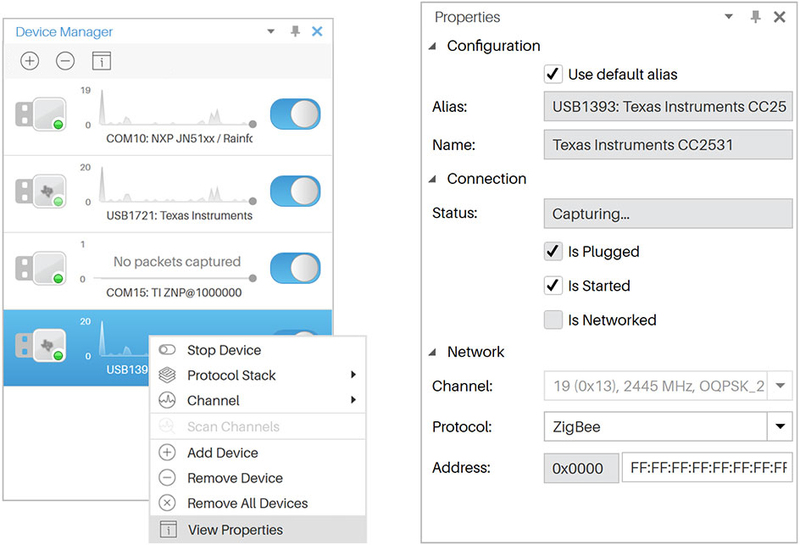 Ubiqua provides a shortcut for this, the Protocol Stack and Channel menu items of the device contextual menu. Right click on a device and make your selection, Ubiqua will automatically restart the device if it was running. To start capturing packets just click on the device switch button or select the Start/Stop Device on the contextual menu. If a problem was found starting the device and you can't stop or start it anymore, proceed to unplug the device and plug it back to your system; usually, this will resolve the problem. If you keep experiencing problems, make sure the port is not being used by another program in your system and try again. Also, please note that according to your license you could be limited to a certain number of devices started at the same time. Whatever the cause of the problem is, the extended status of the device in question will display a possible solution. Devices on the list are maintained by the application and stored in environment files. To remove a device right click on it and select the Remove Device menu item. If you want to remove all devices right click on the Device Manager and select the Remove All Devices menu item. Please note that this action can't be undone. Scan channels allows capturing through all channels or the selected channels. 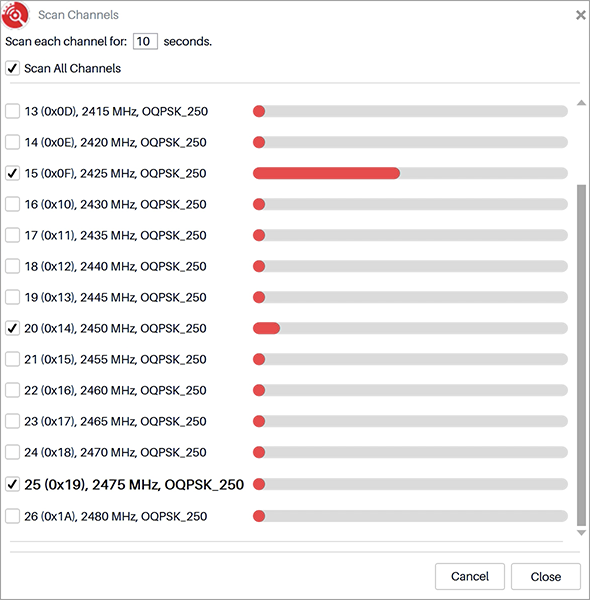 Each selected channel will capture during a specific time, at the end, Ubiqua will show the number of captured packets per channel on a graph. To scan channels, right click on the device and select the Scan Channels… menu item. After the Scan Channels dialog opens, select the channels to scan and set the scanning time per channel; to start the scanning process press the Start button. The graph will display the packets captured per channel when the you place the mouse over any channel. Note that the packets captured during the scanning process may appear in the Traffic View and that the channel list may be different, depending on the capabilities of the device used for scanning.